DENMARK: Four Siemens 7MW turbines will be used at a demonstration project in Denmark, following a call for proposals by the Danish Energy Agency (DEA). In July 2015, the DEA launched a pilot scheme to foster development of new offshore wind technologies and cuts costs to offshore wind. The DEA programme is an extension of Denmark's testing facilities which enables demonstration projects to be established for proving technologies in their intended environments, in this case the North Sea. The Nissum Bredning wind turbine association has won the tender to install 28MW project at a site in northwest Denmark. The association was part of the Aalburg University. It will develop a 28MW project for testing new technologies by installing Siemens 7MW turbines on suction bucket jacket foundations. 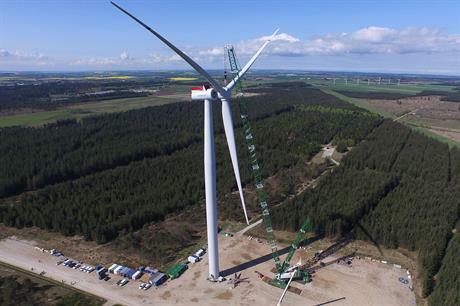 Siemens 7MW turbine is currently undergoing onshore tests at a site in Osterild, Denmark. It was recently chosen to supply Dong Energy's 330MW Walney Extension East and the 1.2GW Hornsea 1 site, both in the UK. DEA said the developer predicts the technology used could save 12.5% in capital and operating costs. The project will be financed via a premium price supplement that guarantees DKK 0.70/kWh (€0.09/kWh) for up to eleven years. EDF-EN and European Energy also submitted applications to the DEA to develop a demo project.